Chi Him Chik is an active performer and improviser from Hong Kong. Graduated from Bowling Green State University, under the direction of Dr. John Sampen, Chi Him is now pursuing his Master's Degree at The University of Missouri Kansas City with Professor Zach Shemon. 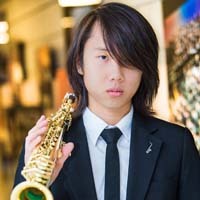 Chi Him is the first Hong Kong saxophonist to advance into the semi-final round in the Jean-Marie Londeix International Saxophone Competition. He is also the prizewinner of the 48th Annual Bowling Green State University Competition in Music Performance, the 55th Annual Lima Symphony Orchestra Young Artists Competition, and the 2015 and 2016 Douglas Wayland Chamber Music Competition. As an advocate of new music, he has performed in many different countries and has commissioned and premiered a number of works by composers including Dai Fujikura, Mikel Kuehn, James Mobberley, Narong Prangcharoen, and more. For more information, please visit www.chihimchik.com.